When you get to our church building you have a variety of parking options. Watch for one of our “Connection Team” members in our parking lot - someone wearing a bright safety vest - who will be happy to guide you to a parking location either in our church lot or one of the other ones close by. Scroll down the page for more detailed information on our location & parking. There are a few doors you can use to come in on Sunday morning and a couple of accessible ones as well, including a lift/elevator. Our two main doors are both located on Queen Street. “Connection Team” members will be at both locations to welcome you and help guide you in and through our building. We offer two different Sunday morning gatherings, with two different styles, as an option for people and families who are looking for a connection to God and to others in community worship which reflects their personal choices of how to connect, worship, and grow. Sunday morning “FirstKids” provides age appropriate groups and activities for babies & toddlers straight through to Grades 4 and 5. Kids are also welcomed to stay in either of our Sunday morning gatherings, if you choose. Our Contemporary Gathering also has a “Kids Corner” located in the back of our gathering where parents can take their babies and toddlers for a bit of activity - all while staying in the room. There are even a few comfortable rockers for you. “FirstKids” groups start at 10:30am and leaders will be there to meet you and your children as you drop them off. Parents can register and drop their children off directly to the proper “FirstKids” room. One of our “Connection Team” members will be happy to help you find your way to those rooms. The CHURCH PARKING LOT is located beside the church and can be entered from Robinson Street. Unfortunately, parking is limited in the Church lot. 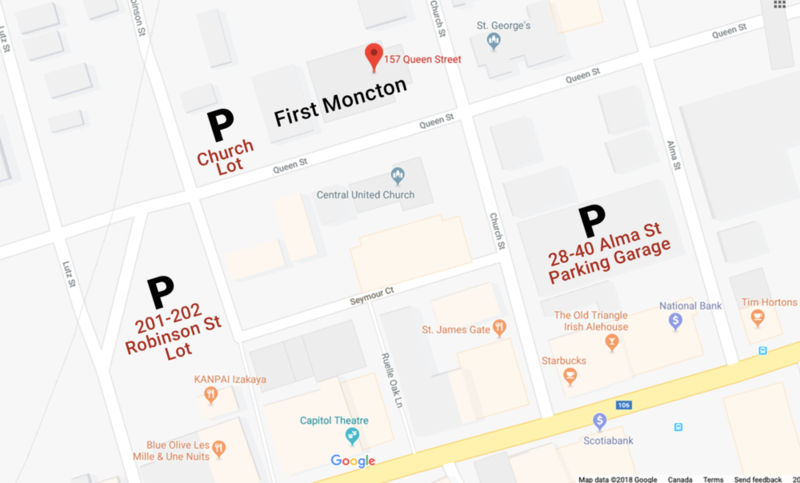 Fortunately, there are other downtown Moncton parking options close by. ROBINSON ST. PARKING LOT is located at 201-202 Robinson Street and is free on Sunday mornings and some nights. Parking fees apply all other times. ALMA ST. PARKING GARAGE is located at 28-40 Alma Street and is free on Sunday mornings and some nights. Parking fees apply all other times. We’d be happy to hear from you. Send us your questions, and we’ll get back to you.